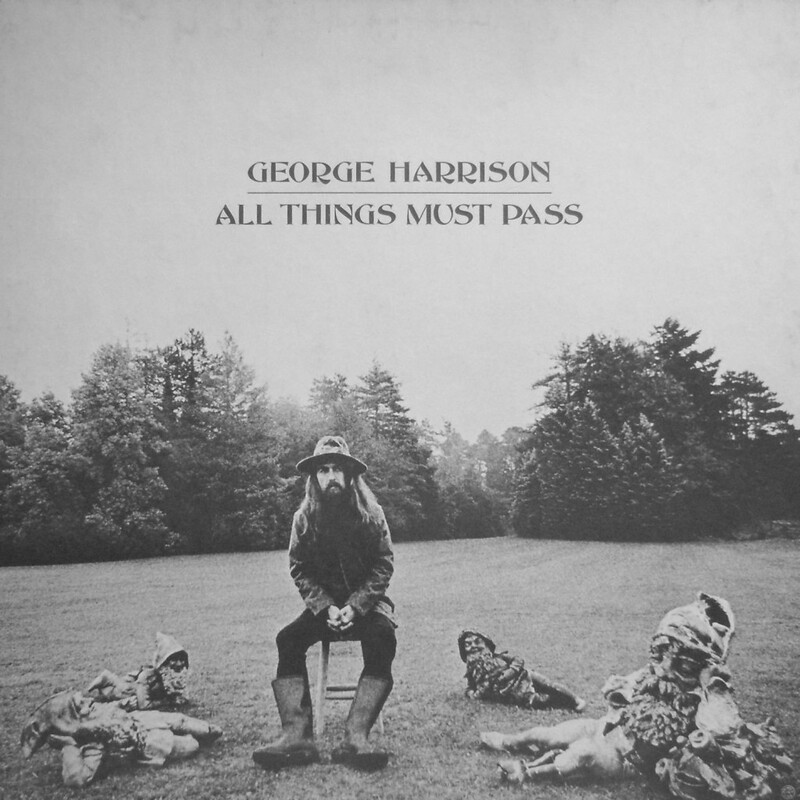 All Things Must Pass introduced Harrison’s signature sound, the slide guitar, and the spiritual themes that would be present throughout his subsequent solo work. The original vinyl release consisted of two LPs of songs and a third disc of informal jams, titled Apple Jam. Commentators interpret Barry Feinstein’s album cover photo, showing Harrison surrounded by four garden gnomes, as a statement on his independence from the Beatles. Production began at London’s Abbey Road Studios in May 1970, with extensive overdubbing and mixing continuing through October. Among the large cast of backing musicians were Eric Clapton and Delaney & Bonnie’s Friends band – three of whom formed Derek and the Dominos with Clapton during the recording – as well as Ringo Starr, Gary Wright, Preston, Klaus Voormann, John Barham, Badfinger and Pete Drake. The sessions produced a double album’s worth of extra material, most of which remains unissued. All Things Must Pass was critically acclaimed on release and, with long stays at number 1 on charts around the world, commercially successful. The album was co-produced by Phil Spector and employs his Wall of Sound production technique to notable effect; Ben Gerson of Rolling Stone described the sound as “Wagnerian, Brucknerian, the music of mountain tops and vast horizons”. Reflecting the widespread surprise at the assuredness of Harrison’s post-Beatles debut, Melody Maker‍ ’​s Richard Williams likened the album to Greta Garbo’s first role in a talking picture and declared: “Garbo talks! – Harrison is free!” According to Colin Larkin, writing in the 2011 edition of his Encyclopedia of Popular Music, All Things Must Pass is “generally rated” as the best of all the former Beatles’ solo albums. During the final year of his life, Harrison oversaw a successful reissue campaign to mark the 30th anniversary of the album’s release. Following this reissue, in March 2001, the set was certified six-times platinum by the Recording Industry Association of America. Among its appearances in critics’ best-album lists, All Things Must Pass was ranked 79th on The Times‍ ’​ “The 100 Best Albums of All Time” in 1993, while Rolling Stone currently places it 433rd on the magazine’s “500 Greatest Albums of All Time”. In January 2014, All Things Must Pass was inducted into the Grammy Hall of Fame. Without a doubt, Harrison’s first solo recording, originally issued as a triple album, is his best. Drawing on his backlog of unused compositions from the late Beatles era, George crafted material that managed the rare feat of conveying spiritual mysticism without sacrificing his gifts for melody and grand, sweeping arrangements. ← November 26: Tina Turner was born in 1939 – Happy Birthday!